Calendar events can be imported into a workspace calendar using CSV files. 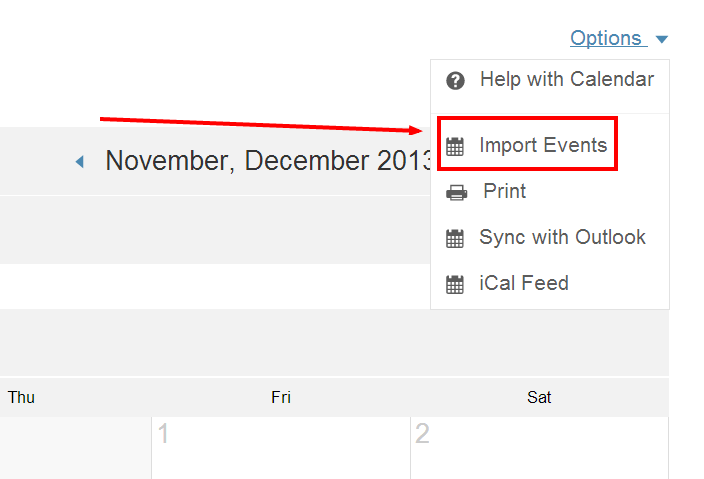 To start importing events, navigate to the Calendar tab of a workspace and click on Options > Import Events. You will need to create a CSV file with Excel, or a Text file, with the required fields listed: "Event Title", "Start Date", "Start Time", "End Date", "End Time". "Event Description" is an Optional Field. Choose the "Delimiter": For CSV, this can be left at "Comma". For Text files, "Tab" is often used as a delimiter. Choose the "Quotes"option: If double quotes are used in the Title, or Description, select the Double Quote (") Option. If Single Quotes are used, select the Single Quote (') option. For each column, select the appropriate Field Name from the "Event Field" dropdown menu. When finished, click the "Import Events" button.